Dean R. Koontz - Shattered | Vault Of Evil: Brit Horror Pulp Plus! It started as a kid's game to while away the long drive across country. It ended in a welter of violence. They're travelling three thousand miles to a golden city and a golden girl. Someone's out to get them. To destroy their dreams of the future. To plunge them into a paranoid nightmare of death and destruction. If the first half of the novel is anything to go by, Shattered really is straightforward as the blurb implies. Recently married Alex Doyle and his super-bright eleven-year-old "son", Colin, are on a five day drive from Philadelphia to San Francisco to start their new life. Alex has landed a lucrative position as commercial artist to a hot, progressive advertising agency, with a luxury three-bedroom Spanish stucco included in the contract. Dream wife Courtney, 24, (Colin's big sister), has flown on ahead to ready their dream home. Life is bliss, it really is! "During the past year, when he sensed the conspiracy working against him, Leland had wondered whether he would be able to kill to protect himself ... Now he could not understand why he had ever been in doubt. When it was kill or be killed, even a non-violent man could act to save himself." Been many moons since I read this but I do have the fondest memory of it of any of the half dozen Koontz I read. Not the clearest, that would be Tick Tock, but my memories of that are not so fond. 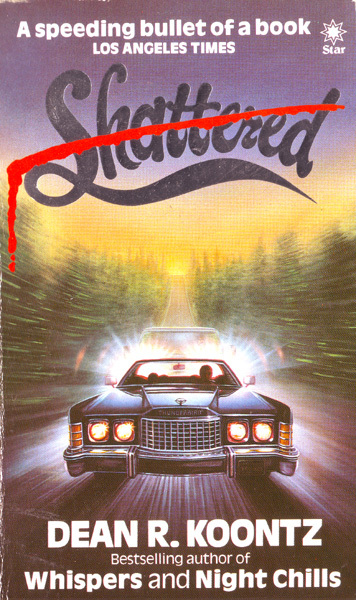 Shattered I recall had some fine tension and paranoid atmosphere, and I have an oddly vivid memory of a rainy motel exterior at night and a simile of a tic tac toe board. It's not long before a colleague finds Pulman's body. Detective Ernie Hovel already knows for sure who's responsible. One of them there long-haired, cop-killing, enemies of decent American citizens, that's who. What do they call them again? "Pacifists", that's it. Alternatively, it might be any one of the "blacks, liberals, spics, peaceniks, women's liberationists - all the lunatic fringe [who] revel in making fools of the police." But it's a Political murder, mark his words. White van man is in the clear! Alex Doyle has come to accept that Colin was right all along. The guy in the removal van has been following them ever since they left Philly. But why? And how comes he seems to know which hotels they're booked into on their nightly stopovers? Leland's patience is exhausted. The sooner the rich creep and the kid are dead, the sooner he and angel Courtney can be happy together forever and ever again. Tonight he'll break into their fancy motel room and knife 'em! So intent is he on his purpose, Leland doesn't even notice the onset of one of the crushing headaches he's suffered ever since he realised the entire world (bar Courtney) was conspiring against him. As it transpires, it's that savage migraine saves Doyle from death and dismemberment in the caretaker's tool-shed that night. Worst of it is, now Doyle knows what he looks like; Tall, mean and nobody home insane. Alex belatedly decides it's time he reported the matter to the police. Unfortunately, he opts for good old boy Captain Ackridge, the single most prejudice character in a novel hardly short of them. Ackridge doesn't care who rammed Doyle's car or attacked him with an axe. He's a long hair, a draft-dodger and he gets paid big money for doing something that sure ain't real man's work - the f**k*r deserves it. The Captain is more interested in whether or not he smokes dope. "I'm not a man you can call a pig one day - then run for help to the next." It's now a case of who can reach Courtney first - and Leland has a head start, albeit he's driving on three wheels. "Paranoid atmosphere" is right! It's a real gem of post-sixties angst, kind of sour, "the dream is dead" hangover fiction. Echoes of Straw Dogs in Doyle's gradual transformation from timid pacifist to club-wielding Western savage. You can bet the first thing he does once the novel ends is cut off all his hair. I also like that Shattered gets its business done in a slick 200 pages. If DRK has any more like this among his early repertoire then I'm up for giving them a go. Though I only read about 50 pages or so (didn't stop for any other reason than that I was probably reading several other books at the same time and it just fell off the map) I recall The Voice of the Night shaping up to be a good little sleek and creepy psychological piece. Just checked and its 277 pages. Weekender rather than a night or so but still not too troublesome. I remember this one. I've read a couple of Dean Koontz but 'Tick Tock' was definitely the strangest. That little cloth doll running around the place still brings a smile to my lips. Thanks for the recommendations, gents. "Watchers", "Strangers", "Chase", "Twilight Eyes", "Night Chills", "Strange Highways" (short story anthology), "Odd Thomas" (his best book in my opinion), "Shattered", "Mask", "Phantoms" (joint favourite) and "Icebound". Some of the later ones like "The Husband", "Life Expectancy", "The Good Guy" and "The Face" are ok. Competently written thrillers. Avoid, if you can find, pretty much all his Ace double science fiction stuff. Anything from the last five years is generally garbage. All in my opinion of course. For a novice who has never read any Koontz I would suggest starting with "Phantoms" and then "Odd Thomas". The sequels to Odd are ok but he seems to be dragging it out now. Some of the earlier stuff like "Chase", "Shattered", "The Vision" and "Mask" are decent and are short and quick easy reads. I think we're all in the majority here when we say Koontz did his best work many years ago. I too agree with the earlier members, The Odd Thomas novels become tedious after the initial book, and much of his work in and around this era concern very rich people from LA or Califonia riding around the country with a dog and an infinite supply of friends and money. And lets not forget lashings of religious significance. Phantoms is by far and away his best book. A total departure from his usual, Man and woman are chased through a full book by a violent killer continuously. This format worked at time, Whispers being the best of the bunch, but he flogged that horse too many times. As for Shattered its been a good long time since I read the book. But I recall liking it. I always thought the young boy in the car was the brother of the girl they are going to visit, not the fellow driving. Anyway, its a one sit read, rather a good companion piece to his other novel Chase. If I'm not mistaken does the little kid in the book constantly wear horror T Shirts each time ? Wolfman, Frankenstein's Monster, The Mummy etc ? That's right, Mr. E. When they set out, Colin's sporting a King Kong t-shirt, and over the course of the journey, goes through his entire wardrobe. I think by the end its a C. Lee/ 'Dracula' effort. And yes, Courtney is Colin's big sis. She and Alex (the driver) have very recently married. And, no. Snowbeast has so far eluded me. Some of the earlier stuff like "Chase", "Shattered", "The Vision" and "Mask" are decent and are short and quick easy reads. Woo-hoo! After the disappointment of Bear Island, I lucked onto Mr Koontz's The Vision. Buoyed by a Kirkus Reviews comment of 'bottom-drawer drivel' I'm speeding through this Christmastime tale of a psychic tracking a serial killer like a bullet. Great fun (considering the subject matter). Colin Wilson's The Occult gets a reference, Peter Hurkos (and a couple of other real-life psyschic investigators) get a name check, and it's fast and furious all the way.